Veracity Pipeline integrity management software provides operators in the Oil and Gas industry with a user friendly and systematic approach to pipeline integrity risk assessment and management. The software geographically presents the pipeline and the risks associated with it whilst securely managing key integrity data and aligning mitigation actions to real time risk values. Veracity Pipeline integrity software an integral part of the operators’ Pipeline Integrity Management System (PIMS). Its structure and design are fully compliant with industry codes and best practice engineering standards. Our pipeline integrity software is a multi-platform product and web based, therefore easily accessible from anywhere at any time. Veracity Pipeline integrity software provides a centralised database for all pipeline engineering and integrity records. Users are given pre-determined access rights to allow changes to be tracked, improving security and allowing unlimited parties global access to data on demand. Data can be linked to multiple documents which are then securely stored against a visual representation of the pipeline, allowing users to easily target areas of concern and efficiently access key information at the click of a button. Data can be stored on client internal servers or using our secure cloud based system which has multiple hosting options. Veracity Pipeline integrity software enables operators to comprehensively assess and clearly understand risks affecting their pipeline systems so that educated decisions on budget setting, planning and deployment of resources can be made. Veracity Pipeline follows a semi-qualitative methodology which promotes group discussion and offers the most comprehensive approach to pipeline integrity risk assessment. The software employs a segmentation philosophy in which the pipeline is sectioned according to different environmental and design conditions. Our threat matrix tool ensures that each section is appropriately risked assessed and all likely threats are covered. All aspects of the risk assessment process can be easily tailored to company specific risk rules and requirements. Veracity Pipeline integrity software contains our predefined risk matrix tables which identify and connect appropriate integrity and testing requirements to threats that are faced within the pipeline system. The operator can then select from a comprehensive set of integrity risk mitigation actions and a multi-layered and systemic Integrity Management Plan is created. Risks are then fed into the risk matrix tables and frequencies of execution according to section specific risk levels are defined. This methodology is proven to optimize inspection and testing requirements and helps to reduce maintenance and inspection costs. 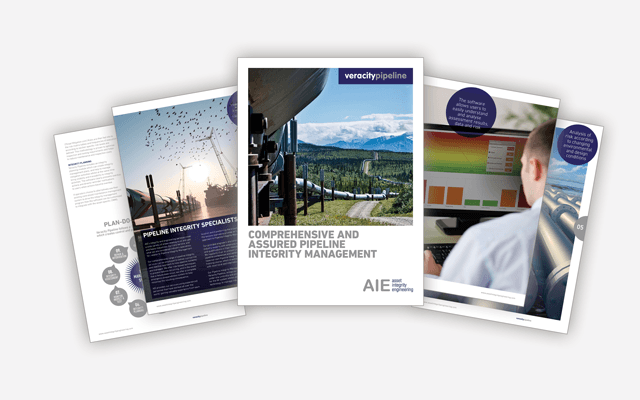 Veracity Pipeline integrity software includes an integrity planning module which can create integrity management plans, and help to manage mitigation activities whilst at the same time bring visibility and traceability to integrity activities. The software clearly presents overdue actions and directs reminder notifications to users when actions become overdue. If operators choose to alternatively use their existing centralized maintenance managements system to drive the integrity management program then the software can be customized to integrate with the asset-specific CMMS. Veracity Pipeline integrity software provides engineers the platform and data to fully evaluate and understand the condition of the pipeline system. The software can be utilized to trend and compare previous data and integrity performance, allowing a detailed and efficient integrity assessment of the pipeline to be performed. By comprehensively understanding the risk affecting the pipelines safe and continued operation, new improved mitigation actions or recommendations can be proposed with the software providing documented evidence and information to support the decision making process. Our pipeline integrity management software includes multiple reporting options which can be run at different levels of detail according to the intended audience. The software can present results against a geographical representation of the pipeline or it can produce detailed reports which include all background analysis and integrity data. AIE understands that each company and operation is different and that’s why we are extremely flexible in the way we provide our integrity management software products to clients. We have multiple options available, from offering a complete Pipeline Integrity Management service using our in-house specialist engineers to setting up the software in our client’s facilities with external maintenance and technical support so that it can be internally operated. Our integrity management software can also be fully customized to project, corporate or jurisdiction specific requirements and it can be linked to existing software such as a Centralized Maintenance Management System. Veracity Pipeline integrity software is simple and logical to operate, with most users only taking a matter of hours to understand its design and architecture. AIE also provides in-house integrity training courses to assist with the use of the software and to ensure that users understand its full capability and how it should be setup and maintained for maximum effect. Our established Pipeline Integrity Management training course is also available to complement the software and reinforce to delegates the background knowledge and engineering methodologies which make up modern risk based Pipeline Integrity Management Systems.